All my life, summer began when the strawberries were ripe. Growing up in Michigan, we picked them as soon as the school year ended. 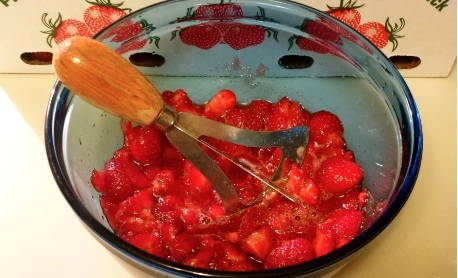 Red stained fingertips and t-shirts were sure signs of strawberry season, jam was served on toast each morning, and my June birthday was always celebrated with fresh strawberry pie. Follow these 3 steps and wow your family with this scrumptious berry dessert! Growing your own strawberries with no harmful pesticides/fungicides takes the gold. Finding a local farm (growing berries the right way) to pick your own wins the silver. Buying pre-picked berries from a local farmer takes the bronze. Purchasing from the store comes in dead last. The stock boy won’t have any idea how or where the berries were grown, and this is important! If you can’t grow your own, check Local Harvest or Pick Your Own to find a farm near you offering U-pick strawberries. Call ahead if possible to find out if the berries have been sprayed with anything. You have the right to ask, and most farmers are happy to answer. 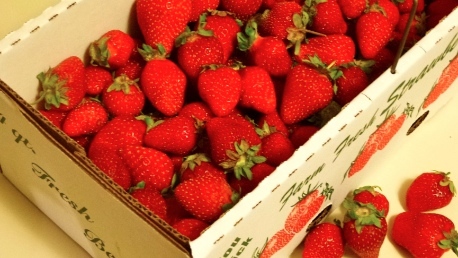 Keep in mind that strawberries are on the “Dirty Dozen” list of produce typically containing the highest pesticide residues, and should be purchased organic whenever possible. For strawberry shortcake, wash and hull a few cups of berries and put them in a bowl. You can add a few teaspoons of sweetener (I use organic cane sugar but use raw honey or maple syrup if you’d like), and begin mashing until the desired consistency is reached. I grew up using this retro berry mashing tool and am transported back to childhood summers every time I use it. Strawberry shortcake is traditionally made with a light, fluffy biscuit as the base. However, there are no rules about how to build your strawberry desserts, so I choose to use other cakes and pastries to mix things up. Try angel food cake, or make simple drop biscuits using homemade baking mix. Cool-Whip won’t cut it! Don’t disrespect your berries, body, and tastebuds like that. 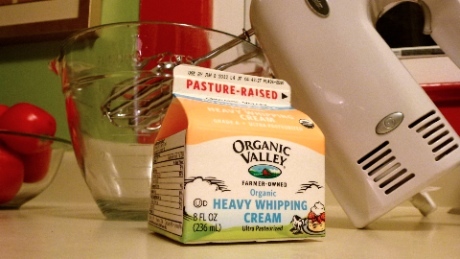 Get your hands on some good heavy whipping cream and prepare to whip the heck out of it. An electric mixer works best, but a whisk and some elbow grease will do the trick in a pinch. A few optional ingredients can be added to the cream before whipping – a bit of the organic cane sugar and maybe a touch of vanilla extract. I use a couple teaspoons of cane sugar per cup of cream and usually don’t bother with the vanilla. 4. 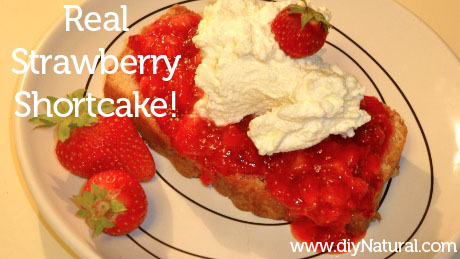 Assemble strawberry shortcake and enjoy! Wowee. That sounds great and I know tastes great too. What do you use when a receipe calls for “shortening”? I have used organic shortening in the past (from the health food store). Many times I will substitute butter though. Wow – a great recipe for strawberries – bought some yesterday at a local market and this year I am going to put them into a scrummy stack – thanks for the recipe! Question: How did you make your homemade vanilla extract? This sounds amazingly delicious and I’m going to make it. I live in Michigan (Lansing area) and would like to try raw milk and its products, but I have no idea where to find them. I’ve also checked localharvest.org. Do you have any recommendations on where to get it or where else to check? BTW, I love the retro mashing tool. Good news Tameka, you can find a raw milk co-op farm in St. John’s. More expensive, but so worth it for many reasons. I suggest joining a group (ask the farmer about it) with other people in your area so y’all can take turns picking up. God bless. Thank you so much, Matt. I am not far from St. Johns. Matt, I checked out the website and it provided lots of important and useful information. However, that farm is in Iowa. Do you know where in St. John’s, MI I could possibly look into becoming part of a co-op? You are absolutely right about fresh, real ingredients making the difference. We have local eggs and a reasonably local and conscientious dairy; however, we miss having access to an abundance of fresh, local berries here on the desert. When we do score on berries, we like to construct our shortcakes using tender, buttery rich homemade scones…recipe from Jean M. Andrews’ In Search of the Perfect Scone.